Founder and leader of the Glorious Word Power Ministry International, Rev. 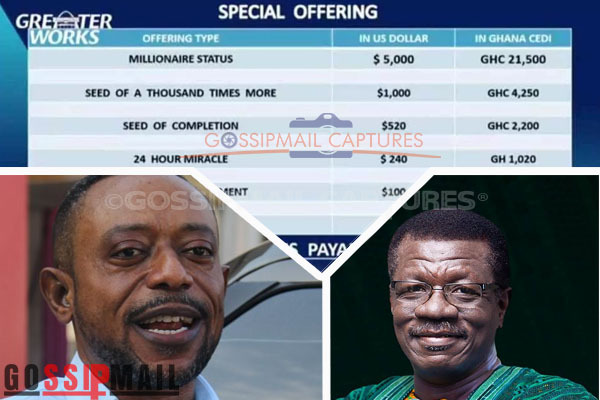 Owusu Bempah has expressed utmost surprise and disappointment in Dr Mensah Otabil, General Overseer of the International Central Gospel Church, for the ‘special miracle’ offering at the just ended ‘Greater Works’ Conference that has gone viral on social media. According to him, Dr Otabil during one of his sermons described Christians as fools for paying huge sums of monies to prophets over miracles and is therefore shocking to see a specific monetary offering notice which promises different rewards at his event. Speaking on Okay FM, Rev Owusu Bempah said he would not condemn people for heeding to the notice. His bane was why Dr. Otabil would come up with such figures after hurling insults at people who give monies to prophets in an anticipation of miracles. He has intimated that Dr. Otabil owes prophets and Christians an apology. Meanwhile, Dr. Otabil, has cautioned believers against applying logic to matters of faith as he posits that belief can make all things possible. “Beliefs goes beyond logic. Logic will tell you what is probable or things being equal. Logic will tell you that if you have a thousand cedis in your account, then you can spend thousand cedis because that is logical. Beliefs will tell you that if you have five loafs of bread you don’t feed five people. “I want you to stretch your faith and you are going to believe according to what is written and what I want you to believe is He says all things are possible, I don’t know what that is to you but it is a blank cheque” he said while preaching at ICGC’s Christ Temple on Thursday.